Induction of Polyploidy and Its Effect on Cannabis sativa L.
Polyploids are organisms with three or more complete chromosome sets. Polyploidization is widespread in plants, and is an important mechanism of speciation. Polyploids can be formed in various ways. The study of polyploids has both important theoretical significance and valuable applications. The production and application of polyploidy breeding have brought remarkable economic and social benefits. 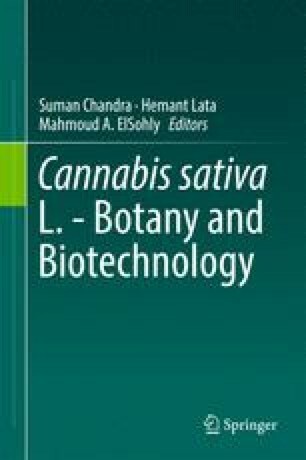 We reported the production of putative tetraploid plants of Cannabis sativa L., with the ultimate aim of improving the medicinal and physiological traits of this widely distributed cultivated plant. The production of tetraploid plant was improved with colchicine at different concentrations and time through dropping method. Flow cytometry analysis was used to confirm the ploidy level. Morphologic, anatomic and biochemical characteristics were compared between tetraploid and diploid control plants. The results showed that 0.2% colchicine for 24 h was the most efficient for production of polyploid plants. The percentage of tetraploid plants and the survival rate were lowered by the increasing the treatment time. In addition, the leaf index and height of tetraploid plants exhibited a significant decrease compared to the diploid plants. The size of stomata on epidermis of leaves were larger in tetraploid plant compared to the diploid ones, in spite of the tetraploid plants have less stomata density. However, the amount of total chlorophyll and carotenoids were almost the same in both tetraploid and diploid plants. In addition, some differences were also observed in the cross section of stem of these plants from a descriptive structural point of view. Overall, the results introduced usage of the stomata parameters as an effective, fast and convenient method for detecting the tetraploid plants. We also investigated polyploidy effects on some primary and secondary metabolites. The results of biochemical analyzes showed that soluble sugars and total protein content increased significantly into mixoploid plants compared to tetraploid and diploid plants. Tetraploid plants had higher amount of total proteins compared with control plants. The results showed that polyploidization could increase the contents of tetrahydrocannabionol only in mixoploid plants but tetraploid plants had lower amounts of this substance in comparison with diploids. Our results suggest that tetraploidization was not useful for production of tetrahydrocannabinol for commercial use but mixoploids were found suitable.